Doing the dishes is one of my least favorite chores, but it must be done. I have shared a few different dish detergent recipes and dish liquid recipe that can be found HERE. 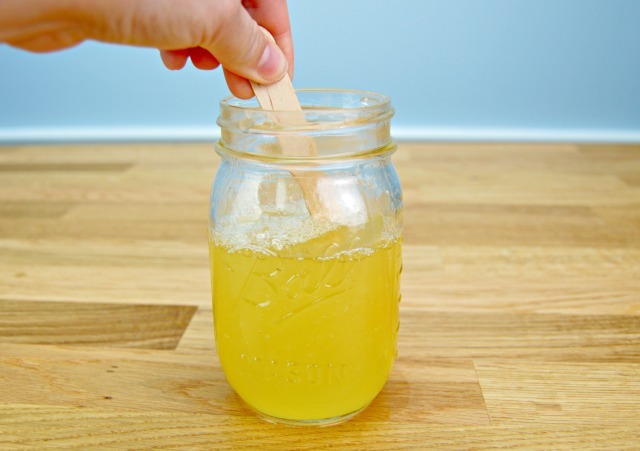 Now I want to share a super simple Homemade Liquid Dishwasher Detergent that only has a few household ingredients. This liquid dish detergent is safe for all dishwashers and will leave your dishes sparkling clean and disinfected too! This post contains affiliate links to Amazon which will result in a small commission for me if you purchase. 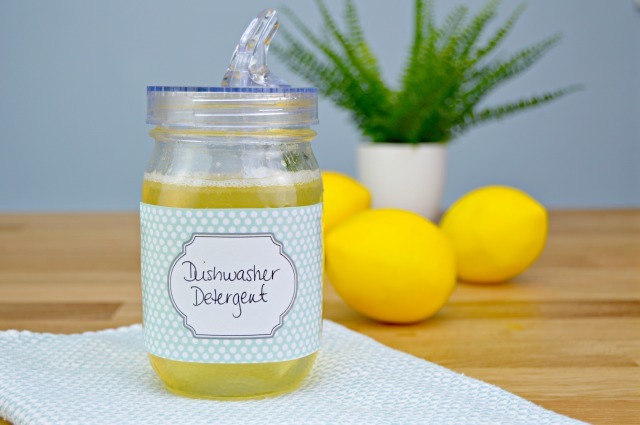 Just 1/2 tablespoon of my homemade liquid dishwasher detergent will get your dishes clean, and this formula will also leave your kitchen smelling lemony fresh! 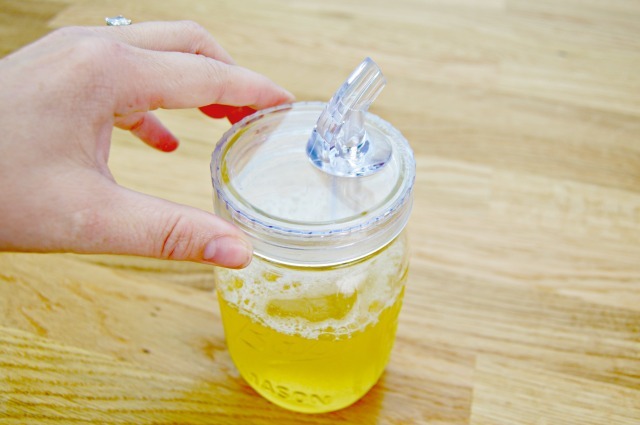 If you are interested in the Mason Jar Pour Spout I use, you can find it HERE. 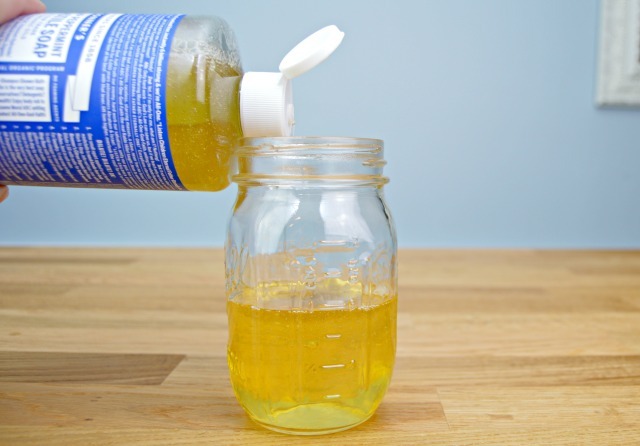 Start by pouring 1 cup of Castile Soap into your container. 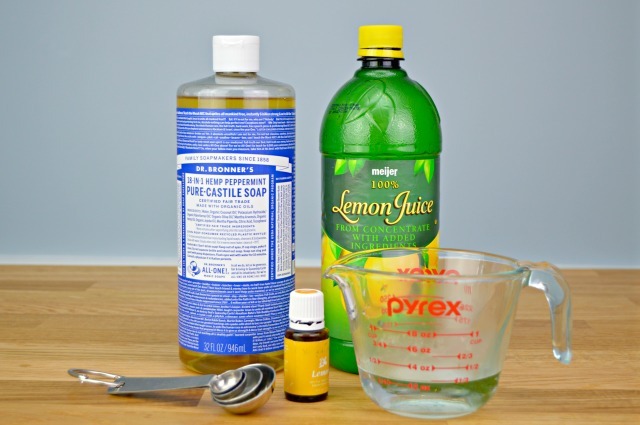 Castile Soap is a vegetable oil based soap. Next, add 1/4 cup of distilled water. 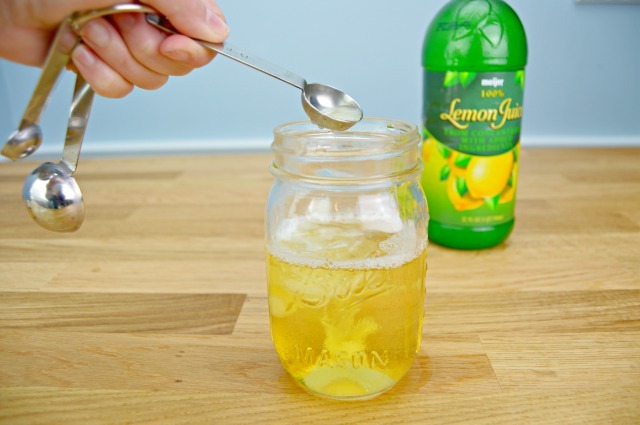 Now add 1 teaspoon of lemon juice. Finish up with 5 drops of Lemon Essential Oil. Place a lid on it! 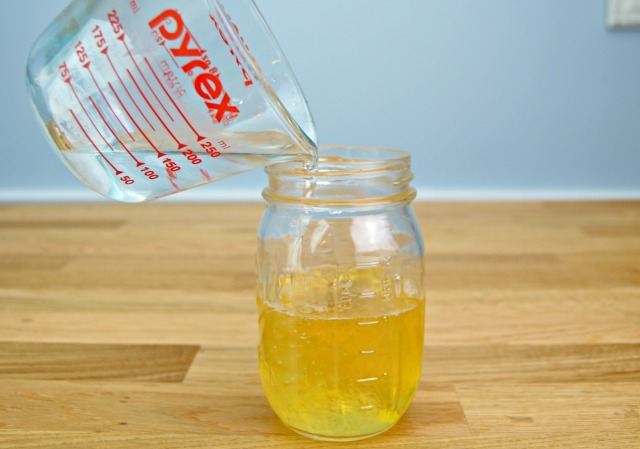 Your homemade liquid dishwasher detergent is ready to use! 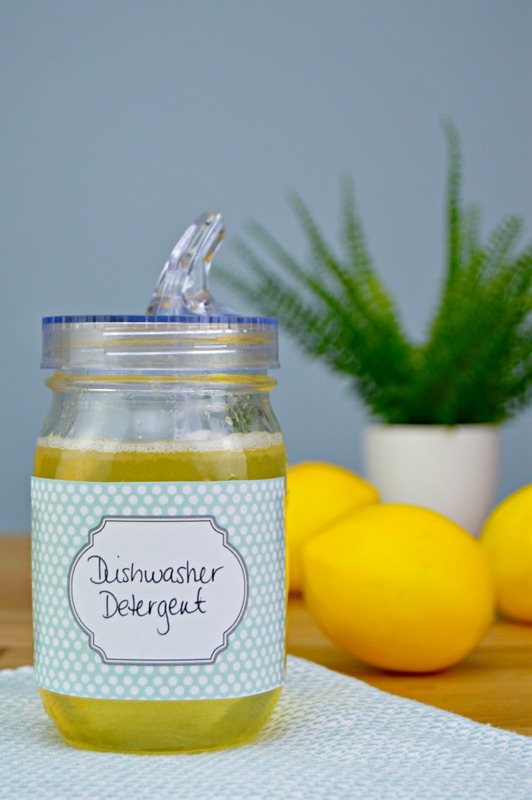 Just pour about 1 tablespoon into your dishwasher’s detergent compartment and run as usual! Extra Tip: Add distilled vinegar to your dishwasher where the rinse aid goes for spot free sparkling dishes! 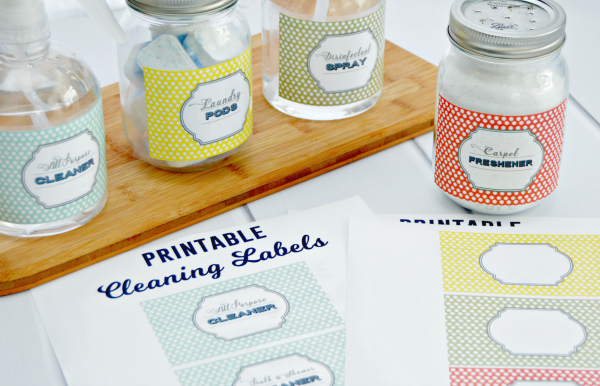 If you’d like to print and use my Cleaning Labels, you can find them HERE for free! 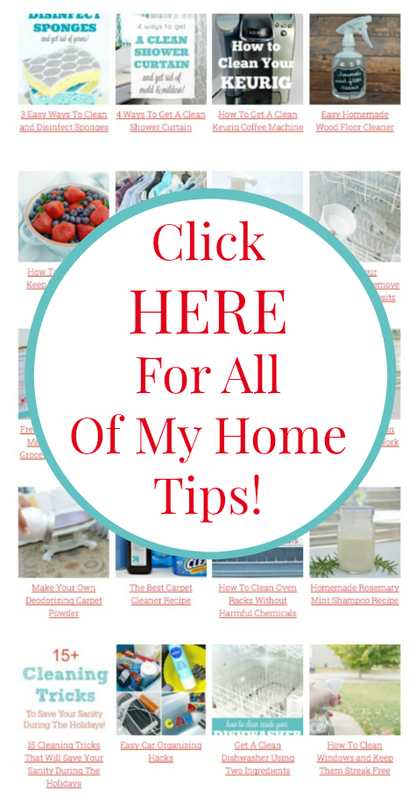 You can find hundreds of Cleaning Hacks, Recipes and Home Tips HERE on my Home Tips Page! If you would type the ingredients in a short list and include the directions we could make a copy of it since you don’t know how to make printable copy. This would save us from having to write down all the recipes. Why do you use distilled water? Can you use filtered water since the water that flows into the dishwasher is regular tap water anyway? 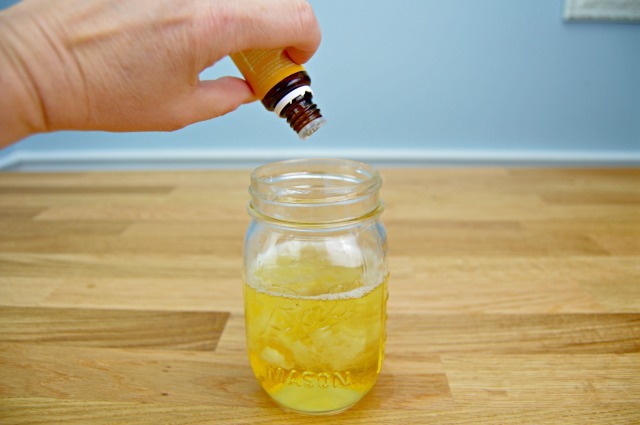 Can you use lemon juice from real lemons or does it have to be concentrate in the bottle? Is it a requirement to use essential oils? Once again you were reading my mind. I hate paying $8 for a large bottle of detergent that does not last month! I was just thinking this morning it was time to start searching for a homemade recipe. Thank you again for somehow knowing what I need when I need it. Not the first or the last I am sure. I’ve used almost the same ingredients about six months ago to make a dishwasher detergent but it was to watery, is yours to watery? what could I of done wrong ? I found with my water it leaves alot of soap bubbles, but i have made your tablets that can be used for toilet or dishwasher and they are totally amazing. Love your site ???? Do you refrigerate it since it has lemon juice in it? Ok, so O just made this recipe, but once I added the lemon juice into the castile soap/water mixture, it turned into white lumps and they wouldn’t mix… why? ?